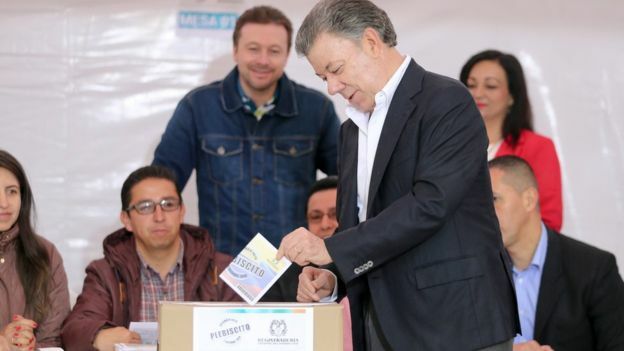 The vote to reject the peace agreement with the FARC and the Colombian government has been compared to the fallout from the United Kingdom’s “Brexit” referendum. The rejection was totally unexpected and the failure to ratify the peace agreement has left Colombian President Juan Manuel Santos and the government of Colombia and the leadership of the Revolutionary Armed Forces of Colombia (known as the FARC) uncertain as to the future of the peace deal which has taken four years of negotiations. (Scottsdale, AZ – October 4, 2016) Colombians vote NO! The vote was rejected by the slimmest of margins 50.2% No versus 49.8% to approve the peace agreement. This shocking development has people wondering what will happen next sending the rebels and the Colombian government back to the drawing board. President Juan Manuel Santos is sending Humberto de la Calle, Colombia’s Chief Negotiator, back to Havana to continue negotiations with the leadership of the FARC including Rodrigo “Timochenko” Londoño, the Leader of the FARC. It has been estimated that 250,000 were killed in the 52-year conflict which displaced as many as 8 million people. Despite reaching the peace agreement, the issue that was the most contentious was the issue of justice. In the weeks leading up to Sunday’s vote, many Colombians were angered by what they saw as insufficient punishment for those who committed a variety of crimes against their people. Out of more than 13 million votes cast, a margin of less than 54,000 votes decided the defeat of the peace initiative. How did the majority of Colombia view justice? Those who voted “no” are holding on to a very narrow view of justice, thinking of justice in a very punitive way. They felt the FARC deserved a lot more jail time and not the minimal jail time proposed in the peace agreement. a system of criminal justice that focuses on the rehabilitation of offenders through reconciliation with victims and the community at large. Despite historic peace deal, over half of Colombia was not ready for an alternative form of justice – restorative justice that focuses on the victims by proposing punishments such as community service and restitution, rather than simply putting perpetrators in prison. At the same time, it attempts to bring armed combatants back into society. That may help avoid what has happened in the past – in both Colombia and elsewhere – when former combatants were unable to find new job skills or build homes and returned to organized violence. Forgiveness sometimes comes at a high price. For many Colombians, the FARC’s past crimes are too much to forgive. President Santos, who focused so much of his energy in ending the war, is unpopular at home which possibly hurt the acceptance of the peace accords. Former President Alvaro Uribe, who led the “no” campaign, was very opposed to the peace accord especially given that his father was killed by members of the FARC. He garnered many supporters to his side. Others have challenged the legality of the peace agreements especially where it concerned the guaranteed seats in the Colombian Congress for the FARC. Why should the US care about what happened in Colombia? Anger is being expressed on the streets of Colombia. The cease-fire with the FARC is delicate at best. Peace negotiations have been going on for decades. Does this sound familiar? In Colombia, there is so much anger that has not been addressed in an effort to heal this nation, employ multi-track diplomacy, and move forward with peace initiatives. There is a lesson here in the United States. If we don’t start addressing the anger felt by so many Americans, peace will be elusive in this country. There is a lesson to be learned about the meaning of justice as well. Just like the Colombians, people in the US are crying out for justice, but what kind of justice are they really calling for? Are we just calling out for punishment, looking through a narrow lens of what justice stands for or is there something we can learn about restorative justice? Holding onto an inflexible understanding of justice does not lead to a transformation of the conflict. The way people think needs to become more flexible so that the voices of everyone can be heard and adapted to what is feasible and realistic in the process of resolving the conflict. Clearly there is a rocky road ahead. In a society where violence has been embedded in its DNA for the last 50 years, and where violence is expected, this monumental shift in what has just happened has caught the attention of all those involved, taking Colombians down a new path in their history. The unpredictability of the situation could still lead to the opening of the doors of hope where forgiveness can take the place of anger with a forward motion towards a peace and reconciliation process in the next phase of Colombian history. Colombia cannot stay in limbo for very long. INTERNATIONALLY RECOGNIZED AS THE WORLD’S LEADING EXPERT ON THE HEALING OF NATIONS, POLITICAL FORGIVENESS, AND MULTI-TRACK DIPLOMACY.